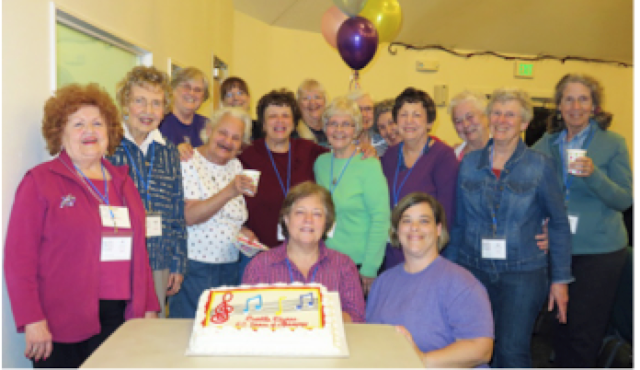 Shoreline Area News: Seattle Shores Chorus - We love to sing! Seattle Shores Chorus - We love to sing! We Love to Sing for You!! We are the Seattle Shores Chorus and we meet at the Shoreline's Unitarian Universalist Church at 14724 1st Avenue NE in Shoreline on Tuesday nights from 6-9pm. Anyone can learn to sing if you have a willingness to learn. It is helpful if you can read music but not necessary! "You were wonderful." "The phrasing and endings were done with such finesse." At one concert a woman complained, "You are singing too loud." Another woman looked at her and said, "Be quiet and sit down!" Recently, a man came up to one of our members and said, "I'm looking for my wife. Are you her?" We make people cry with the song “Turn Around” as the song reminds them of their children. Many sing along with the patriotic songs. “Swing Down” is another fan favorite for its lively rhythm and upbeat tune. At the end of each performance, we go out into the audience and interact with the people. It is like seeing old friends, for the ones that come back to see us again and again. That is why we sing – to bring joy to others through music! If this sounds like something that you’d like to be a part of, we welcome new comers and would love to have you join our group. If you come by and start learning now you could sing with us as a guest at our Holiday Performance. For more information, contact Christine Allen at 425-463-6650 or you can send us an email at Seattle.Shores@yahoo.com.